The weekend of July 13-14 was one of those we live for in Oregon and SW Washington. Both days dawned bright clear and warm. Saturday afternoon saw 14 of our Thunderbirds and about 35 club members at President Loren Wagnild's home for a BBQ and short business meeting. Loren and Donna hosted a great event. The grill was covered with hamburgers and hot dogs. Plenty of fried chicken was available for those preferring it. There was a wide selection of salads and other side dishes available. Plenty of desserts were also available. This editor thinks the hit of the day was the pie that Helen Bartlett brought. Shari's, Marie Calander etc can brag about their pies but believe me none of them hold a candle to Helen's pie. As far as I know the only down part of the day was the arrival of Ron and Helen. Unfortunately Ron backed over the edge of Loren's gravel driveway just a bit too much and got stuck. Loren was quick to the rescue with a tow strap and his tractor. 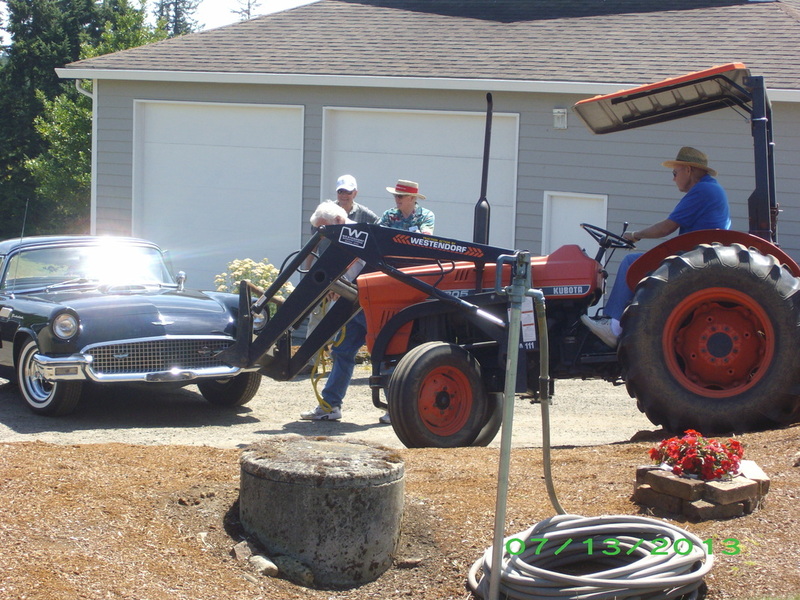 The tractor won the tug-of-war and easily pulled Ron's Thunderbird back onto the driveway. No damage was done. So no harm, no foul. After the meeting, dinner, and the obligatory socializing most of the club headed off for a tour of a wildlife refuge.